Many of Nigeria's most noteworthy landmarks are man-made, including a number of prominent statues and formal city squares. Others, such as Zuma Rock, the Gurara Falls and the Owu Falls are all features of the amazing and captivating natural landscape of Nigeria. Lagos Island contains some of the country's most obvious and eye-catching landmarks, such as both Taiwo Olowo's Monument and Tafawa Balewa Square, while close to Abuja is the majestic backdrop provided by Aso Rock. In Benin City, the Benin Moat is of epic proportions and more than worthy of a photograph or two. This prominent Lagos monument, located on Broad Street, houses the tomb of Chief Daniel Conrad Taiwo. History records that Taiwo arrived in Lagos in 1848, starting out as an apprentice and ending up a notable political figure. It is widely believed that this famous bust of Taiwo was manufactured by melting down many thousands of individual copper pennies. This busy central square in Lagos is used for all sorts of celebrations and official functions, and is where visitors will find many of the city's memorials and statues. 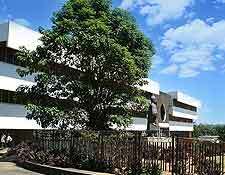 Nearby is the National Assembly building and the multi-purpose Onikan Stadium, as well as the National Museum of Lagos. Tafawa Balewa Square was named after Nigeria's first prime minister. 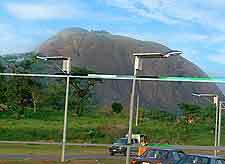 Rising some 936 metres / 3,070 feet above sea level, Aso Rock is the largest of the rocky outcrops that can be found near the capital city of Abuja. Within the rock are a series of caves which are accessible to the public, but only with prior permission. Various important buildings are located around this giant 400-metre / 1,312-foot monolith, such as the Nigerian National Assembly, the Presidential Complex and also the Supreme Court. 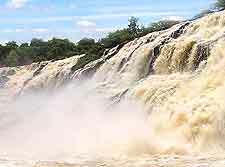 During the rainy season (from July to September), the Gurara Falls are at their most dramatic, measuring roughly 30 metres / 98 feet at their widest point. Even in the dry season (between December and March), it is still well worth a visit, since the multitude of natural flora is then exposed, and with calmer water, swimming often becomes possible. The falls are situated on the road that runs from Suleja and Minna in Niger State, with plenty of adjacent opportunities for hiking and picnicking. Known traditionally as 'Iya', the Benin Moat is the largest man-made earthwork anywhere in the world. Constructed in the 13th century, at a time when there were no labour saving devices, it really is an astonishing achievement. The Benin Moat forms part of an ancient wall built to protect the royal city and was extended during the 15th century, meaning that it now stretches for a staggering 3,200 km / 1,988 feet in length. Reputed to be the steepest natural waterfall in West Africa, the Owu Falls is a relatively gentle cascade and is always popular with tourists, offering great photo opportunities. 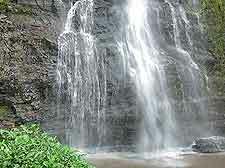 Situated in Kwara Sate and surrounded by lush tropical rainforest, the best time to visit is during the rainy season, when the Owu Falls are at their most dramatic. 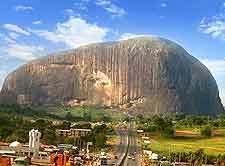 Standing close to Abuja and directly to the north of this capital city, Zuma Rock has to be one of the country's most recognisable and iconic natural landmarks. Located off the main Abuja to Kaduna road, this huge monolith is easily accessible to most visitors and is quite impossible to miss, often being known as the 'Gateway to Abuja' and towering more than 700 metres / 2,300 feet above the surrounding landscape.